This Easter, there’s a spectacular 4-date bank holiday weekend in Newcastle as Bongo’s Bingo creates a candied wonderland at Boiler Shop. Now if you don’t know about Bongos Bingo and wondering what all the fuss is about then I highly recommend having a read and watch of the videos so you can see the madness from my visit last year here! Micky Pickles and The Chocolate Factory is a fantastical land of pure imagination, a world where those with a sweet tooth, in particular, will feel very much at home. Now, this just sounds amazing with promises of a sweet-scented environment, infused with magic, surprises and even a real live Oompa Loompa all the way from Loompaland! 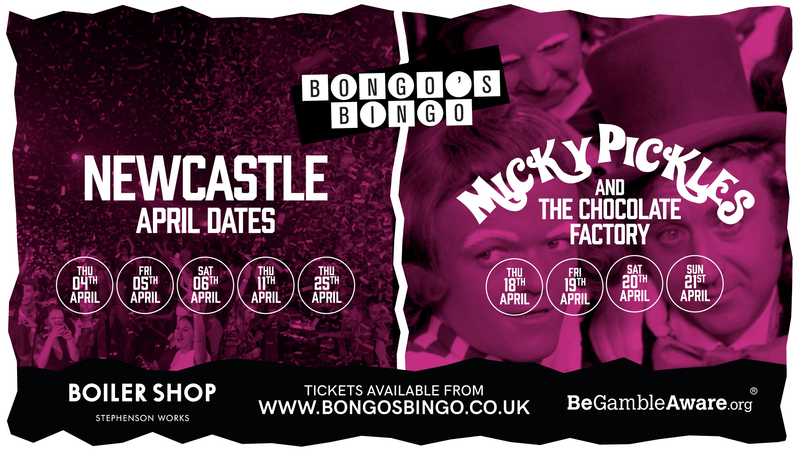 It sounds like Bongo’s Bingo Newcastle is the place to be this Easter! There are also a series of flagship shows on Five flagship shows take place across 4th, 5th, 6th, 11th and 25th April. So who’s setting a reminder for tickets?